What is A Good Euphonium for a Student? "What is A Good Euphonium for a Student?" It can be confusing trying to choose your first euphonium as a student. There are established brands which are popular and have been for many years. There are more and more unknown brands which are extremely low in price and of equally low quality. If a brand new euphonium costs 1/10th the price of an established brand, how good do you really think it is? Would you buy a new computer, cell phone, or car that cost 1/10th the price of a regular model and expect it to be just as good? Probably not. Junk at a bargain price is still junk. The names "euphonium" and "baritone" are basically interchangeable at the student instrument level. 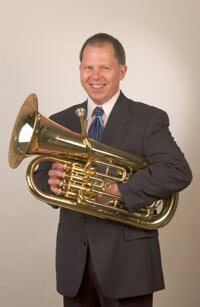 A euphonium is a larger instrument than a baritone when you get into pro level instruments. Jupiter is a popular brand, but there have been many problems with their valves. This may have been improved by now, but I haven't seen it yet so I won't list them here. Holton, Weril, and Getzen have a half-size baritone for beginners if you need something for younger students of a smaller size. The Yamaha 321 plays so well that it is often used by many pros. I used it myself for many years, but now prefer the Holton Collegiate B490RS. It takes a large shank mouthpiece, allowing for the use of a wider selection of larger size mouthpieces. It has a fuller tone, better projection, and more even intonation, in my opinion. The established brands may cost more, but you get what you pay for, as they say. For mouthpiece information, see What Is A Good Mouthpiece Size For A Euphonium Student?